As a blogger, I reflect upon this topic frequently. While I feel uncomfortable with the idea of writing sponsored content, when an invitation comes my way that particularly appeals to me I will generally accept it. If I feel strongly enough about the experience afterwards that I want to spend my precious free time blogging about it, I generally will. Case in point: appearing here on the blog shortly is a write-up of a meal I had at a Very Nice Restaurant I visited as part of a famil Tourism Victoria hosted for a group of journalists and bloggers. It's a restaurant I'd been dying to visit for months (and would always have written about, even if I had not been invited), so I felt comfortable accepting the invitation. I think every blogger has a right to draw their own line in the sand, and that's mine. That said, as an avid blog reader, the simple truth of the matter is that I find I'm not interested in reading blogs that are increasingly filled with sponsored content. I thought I'd write a short post about some of the food blogs I have been enjoying recently - blogs that I love for their individual voices and distinctive approaches. As someone who loves eating out and seldom finds takes the time to cook complicated recipes, I tend to read more "dining out" than "dining in" food blogs. Looking through my favourite recipe blogs in Google Reader I realise I'm a sucker for pretty pictures, as I tend to lean toward well-written blogs with beautiful photographs to match (eg Nourish Me, Cook (almost) Anything at Least Once and Momofuku For 2). Speaking of beautiful photography, I don't know the coffee geeks who write Espresso Melbourne but I'm currently BESOTTED with their gorgeous blog posts about Melbourne "cafes that matter". 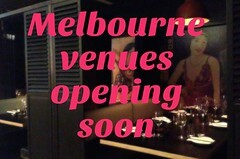 The very functionally titled Melbourne Cafes Photo Blog is another recent find. Mellie and EG's blog Tummy Rumbles has long been my favourite Melbourne food blog: as I've mentioned before, it was my direct inspiration for starting my own blog. I also love It Pleases Us, the blog my friend Em writes with her sister-in-law Sas, as it's very well-written and strikes a good balance between restaurant reviews and recipes (it was also a useful resource for my recent sea-salt-encrusted chocolate chip cookie recipe baking TRIUMPH). Oh, and the internet has spawned several pale imitators, but my friend That Jess Ho is the original Gonzo food blogger in Melbourne. Sunnybrae and The View From My Porch are two blogs I enjoy reading that are written by chefs who really "get" food blogging. On TVFMP, Steve's July post about his "small business dilemma" was a post that really stuck with me. Foodhands is a lovely website started recently by Melbourne blogger Tresna about "food, people, and the stories that connect them", featuring interviews with growers, artisan producers, chefs, waiters, sommeliers, restaurant reviewers, baristas etc. It's the only site I know of that fills this particular niche in the Australian food blogging community. As a Richmond resident, I was pleased to find SwanBridgeVic, a new hyperlocal site dedicated to the 3121, much as Fitzroyalty is dedicated to the 3065. I tend to focus on Melbourne food blogs, but The Unbearable Lightness of Being Hungry is a fabulous Sydney food blog I only recently discovered for myself. Speaking of Sydney, I'm heading up there on Thursday: any food tips or links to good Sydney food blogs I may not already know about would be much appreciated. There are LOTS of other Melbourne food blogs that I love, links to most of them appear in one of the boxes to your right. Oh, and these aren't food blogs, but they're local blogs I love reading that I wanted to plug: Lucy's brilliant, brilliant design blog The Design Files, Caustic Cover Critic (an excellent blog about book design, written by a chap in Adelaide) and Ryan on Coffee, a frequently hilarious blog written by Cat Empire bassist Ryan Monro. As much as I enjoy his Brunetti Stopwatch Challenge posts, my favourite Ryan on Coffee entry would have to be a three-way tie between the footnoted post about Sensory Lab, the recent post about bills in Surry Hills (written entirely in lower case) and the post about the piano solo in Guru Josh's 'Infinity' ("the only thing that's more badly executed than the last two seconds of that solo is the first thirty-eight"). Which food blogs (other than your own!) do you think deserve a plug? 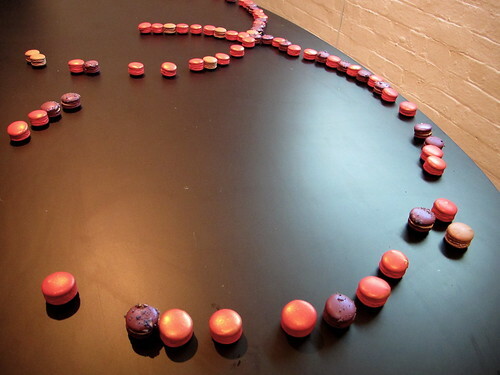 The gratuitous macaron and truffle photos used in this post were taken at Alana Kennedy's Orpheus Diningroom Project MMX, an art installation exhibition opening I attended recently at fortyfivedownstairs. 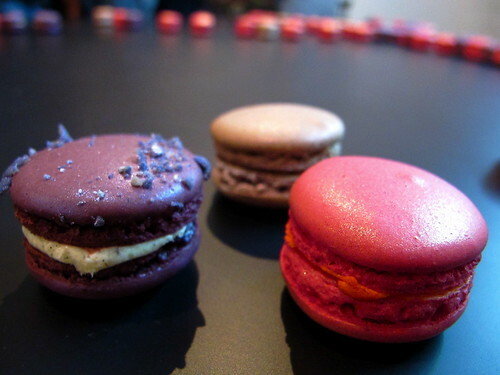 The 300 macarons were made by Shocolate and the three flavours were Cherry Red B52, Macadamia & Vanilla Violet and Truffle & Chocolate Truffle. 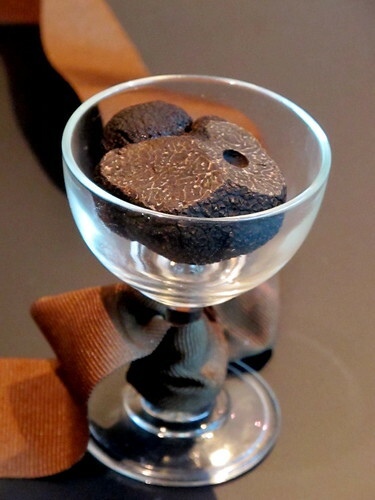 As you might expect, the truffle/truffle one was VERY earthy, but the other two were exquisite. Woo great post - Glad to say I'm subscribed to most of those blogs you mentioned. Thanks for the heads-up about Melbourne Espresso. Nice looking site. And I didn't know that Ryan on Coffee was the dude from Cat Empire. Quite a quirky blog that one. The macaron shots are brilliant too. Shocolate is a very awesome shop - we went to a choc appreciation night there and was quite enamoured with the French chocolatier and his passion for his craft. Interesting that this debate has hit Melbourne as well - also a big issue in the UK. It is actually extremely rare to find a blog (I think there are basically a handful) who have not accepted any invitations/freebies at all in the UK. The debate has now moved on a bit to whether people acknowledge these freebies in their post. 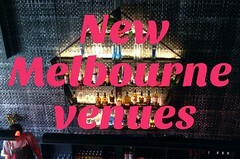 good to see you highlight some lesser known Melbourne bloggers that I can now discover! I don't know Em or Saskia at all, but "...it pleases us" is definitely one of my favourite blogs though it guilts me into wishing I could bake! I guess it's kind of embarrassing to admit that I really love your blog and it definitely inspired me. I got a bit excited when I saw unread items for Melb Gastronome in GReader! Ah, Claire! So true! Though I've stopped taking freebies myself as it does make me feel very uncomfortable, particularly when they dictate editorial guidelines! Nice post... a few I've mistakenly never subscribed to and a few I've never checked out. Lovely pics and simple, tasty recipes. Ahh...I'm starting to feel like an old cynical blogger now, as I too am starting to tire of some of the advertorial type posts of late. *sigh* but then, I need to blog to actually be called a blogger, of which I have been a bit too quiet of late! The "Sell Out" is on...understandably so because people with finite incomes (and that is all us really) can only go to so many restaurants without incurring the wrath of Mr Visa. I personally see blogs as an independent (faceless) source of restaurant information that gives them more integrity than the press. Afterall what Sydney restaurant is going to give Terry Durack poor service ???? When bloggers accept a free meal, the integrity disappears because no matter how objective the writer is, the restaurant will do there damn best to make sure you get the best experience and in some cases at a higher priority over other diners. As a result, I simply don't take these blog entries into account when deciding where to go. As a blogger who doesn't accept restaurant invitations and freebies (which explains the infrequent nature), I value blog entries for their independence and not being a cheap vehicle for restaurant PR. Hiya Claire-thanks for reading and thanks for mentioning my blog! Yay, a share the love post! Apart from Where's the Beef (http://herestheveg.blogspot.com/) who are probably the sole inspiration behind numerous veggie blogs, including my own, two other blogs that make me giddy when I see that they've updated are Do You Want To Stay For Breakfast? (http://doyouwanttostayforbreakfast.wordpress.com/) and Vegan About Town (http://veganabouttown.blogspot.com/). Thanks for the post Claire, especially for the shout-out for my blog as well! It's amazing when you don't look at your site for a couple of days (uni essays), and when you come back the average number of viewers shoots from about 20 to 200! I've got quite a few of the blogs you've mentioned on my RSS feed, but I'll probably add a few more after going through the ones you've recommended - cheers! Rather ashamed to say that I went through my blogroll 'tother day for the first time in an age, and so many of the blogs I'd linked to had dropped off the radar...glad to see some new and interseting ones here, Claire! Terrible spelling...in that comment of mine...apologies! Thanks for sharing Claire! I hadn't heard of most of the blogs you listed there.. but I'll be sure to visit them now!!! I suppose like any industry, things will go through phases ie. commercialisation at some point. I'm very new to the blogging community, so I've probably not noticed that change, but it sure does raise a lot of issues over individual voice and reviews. What a handy post! I'm a big fan of 'it pleases us' too. The other blog/site that has been super handy for me is www.heybambini.com.au - it reviews and rates cafes all over Melb for how kid friendly they are. Not sure if you ever dine with little ones but it's pretty essential reading for new mums who still like to eat out.